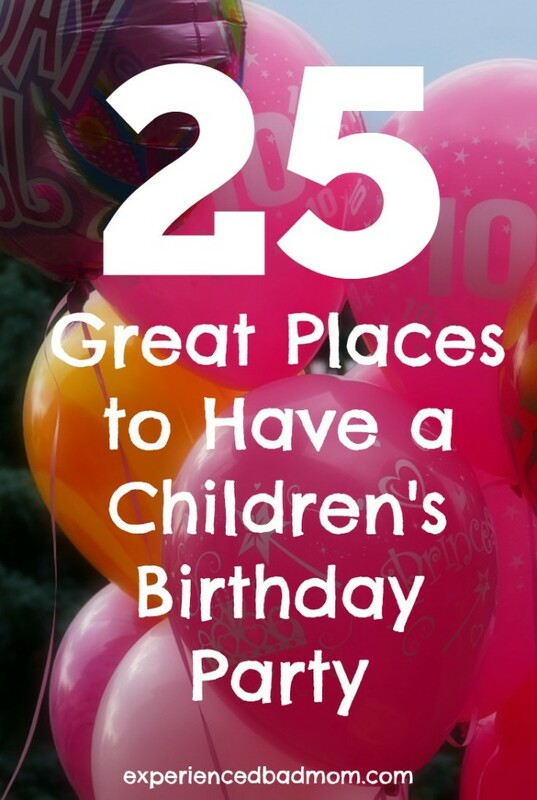 Want to know 25 Great Places to Have a Children’s Birthday Party? You’ve come to the right place! That’s because with two kids, ages 9 and 12, I feel like we’ve run the gauntlet with children’s birthday parties in the last decade. You name it, we’ve attended it or hosted it. So if you’re looking for ideas of locations to hold your child’s next birthday party, then read on. There are loads of great venues for parties, you just have to take the time to find the right one! Did you notice one venue in particular that I left out? Yup,that pizza-proffering, dancing mouse named Chuck E. Cheese. I must say my kids loved attending parties there, but every party I ever went to (when the kids were little and I chose to stick around vs. leaving them) made me want to gauge my eyes out and bathe in hand sanitizer for a week afterward! I also want to add that some of the best birthday parties we ever hosted were in our home. I fretted so much that our home wasn’t big enough or exciting enough, but we did fine and no one trashed the place! 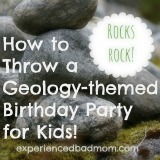 Check out my Geology-themed birthday party as an example. Now tell me about your favorite places to have or to attend a children’s birthday party. If your kids are older, do you miss those birthday party days at all? Don’t rub it in if you don’t – ha! 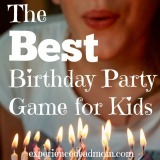 If you liked this post, then you may also be interested in these birthday party posts! We’ve always done home parties, except for a very few. My other favorites are: parks (free! no cleaning up!) One year we took a group of 11-year-olds to the mall, split them up into teams (an adult went with each team) and got a list of questions to answer (things like “How many buttons on the elevator? What’s the store next to Macy’s? How many skylights are there?” ) Another year we took a group of 10-year-olds hiking on a letterboxing trail (it’s like Geocaching but more low-tech, kind of like a treasure hunt that someone else planted). That was probably my favorite because Phillip took them and all I had to do was tell them to have fun! We’ve since forsaken large birthday parties and usually do a small family thing. Recently we’ve done one at a trampoline park like you mentioned, or we go to a local small-scale amusement park. Next up is bowling. We’ve done family parties at the park but those were so stressful that I stopped doing those! Ha about the family parties at the park! Mercifully, our families don’t live close enough to attend birthday parties. I say mercifully because I do believe their presence would just add another layer of stress. What a wealth of info here, Katy! Good on you. I’m off to share. The new one for me was the humane society. How does that work. Kids go and visit with the dogs and cats? Take ’em out for a cuddle and a walk? Love to hear more about that. I’ll never forget the swimming party where I poured rootbeer all over a guest, another threw up, we forgot the goodie bags and my son and a guest both forgot their suits. Uh huh. Very special. I always loved home parties (with the exception of sleepovers). Once year we did a murder mystery party for my then junior high aged daughter. It was a blast. Now I’m looping back to kids’ parties with the grandkids. So much fun! I am trying to avoid sleepovers. I’m too scarred from my experience attending them as a child! Plus, I like sleep. It’s neat that you are looping back around and getting to enjoy your grandkids’ parties. With Pinterest these days, there sure are plenty of cute decorations and game ideas out there. Nice! Natalie had hers at Chuck E Cheese before. And this year we’re doing a bounce house. My son does not like birthday parties so we’ve always just done family ones. And then we take him to Texas Roadhouse, his favorite restaurant. A Texas Roadhouse just opened near us. We’ve never been, so we’re waiting for the crowds to die down and then we’re going to try it. If Tommy likes it, I bet my son will like it too! I love the idea of a zoo or botanical garden. My daughter loves animals. However, for her first birthday we just did me, Dada, and Miss Olivia, along with a giant piece of chocolate cake. She couldn’t figure out how to pick it up and ended up just face-planting into it. It was memorable.